Posted on: July 13, 2015 By: Christopher Brown, Esq. Being charged with driving under the influence can wreak havoc on your life. In addition to being arrested and jailed, you may face the embarrassment of having to call a friend or relative to post your bail, and then you must face a judge in a courtroom. If you are convicted of driving under the influence, the penalties are harsh. You may be incarcerated, forced to pay a heavy fine, and have your driver’s license suspended. For more information about the penalties for driving under the influence in Virginia, continue reading. As soon as the flashing blue lights appear in your rearview mirror, the police officer begins collecting evidence to use against you in a Virginia court. The police officer documents all of this evidence in the police report, which is his or her official account of what transpired during your traffic stop and subsequent arrest for DUI. When you see that you are being pulled over by a police officer, act calmly and rationally. Pull over to the side of the road as quickly and safely as you can. Refrain from making any sudden movements or acting suspiciously. 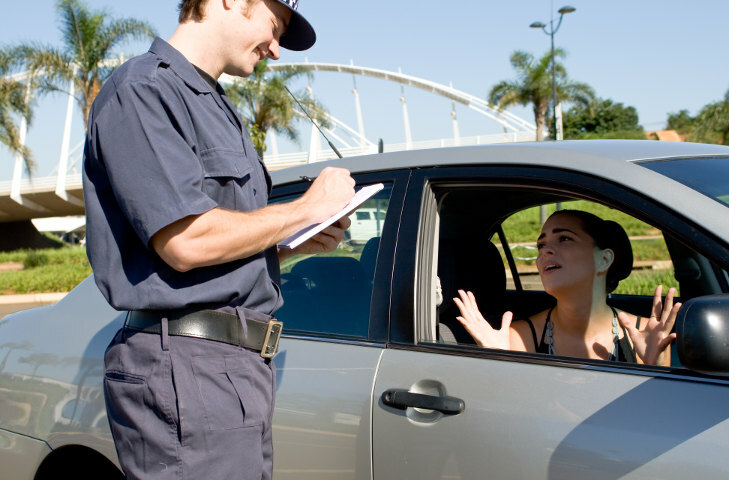 What is ‘Reasonable Suspicion for a DUI Stop in Virginia? Although many of these factors can have other causes besides alcohol or drug intoxication, including nerves or an illness, be aware that the officer’s perception of your intoxication or sobriety will impact how he or she proceeds during the situation. You must remain calm and stay focused during the traffic stop, despite feelings of fear, anger, or nervousness. Be polite; insulting the police officer or making sarcastic remarks will certainly not help you and may be used against you in court if these remarks are included in the police report. Behaving uncooperatively could escalate the situation into a confrontation, leading to your arrest. For more tips on how to conduct yourself during a DUI investigation, read What To Say If You Are Pulled Over For A DUI or DWI in Virginia. In general, you should do anything the officer asks you to, regardless of whether you think it is fair. However, notes of your encounter with the officer, including any of his or her requests, can be key evidence in your defense case. Your Virginia DUI lawyer may be able to use this information to assist your case, so be sure to take notes. If you do not comply with the officer’s commands, you may be charged with resisting arrest, even if you do not assault a peace officer. Even though you may be nervous, scared, or angry during the traffic stop, it is important to remain calm and focused. Insults, sarcasm, and complaints will not help your case, and may work against you if they are recorded in the police report.Furthermore, uncooperative behavior could escalate into a confrontation with the officer, which may even lead to an arrest. Generally speaking, if the officer asks you to do something, you should do it, even if you think it is unfair. Keep notes of what you are asked to do, however, as this evidence may be a key piece of evidence in your defense case and your Virginia DUI lawyer may be able to use this information during your trial. Refusing an officer’s command could result in a charge of resisting arrest, even if you do not actually assault the officer. One of the most common questions from police officers during DUI traffic stops is whether or not you have consumed alcohol or drugs. You are not required to answer the question, nor can you be arrested for refusing to answer. However, if you have not been drinking alcohol or using drugs, telling the officer is in your best interests. You may be asked to take a roadside breathalyzer test. You are not required to take the test. However, because Virginia has an “implied consent” law, failing to submit to a breathalyzer test at the hospital or a police station can result in the suspension of your driver’s license. If you have been charged with a DUI or DWI in Virginia, contact The Brown Firm PLLC online or call our offices. We offer free consultations so that you can discuss your options moving forward.